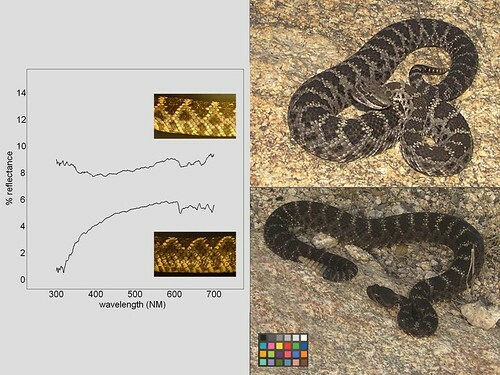 Although Bane (adult male Arizona black rattlesnake) didn’t enter our radio-telemetry study until 5 August 2012, we first met him during last year’s Spring Snake Count. I had led a group of Snake Counters to Secret Springs, a warm-spring-fed pond that was formerly a cattle tank. One of the Snake Counters encountered Bane on the far side of the pond, where he was drinking. Since we began tracking Bane with radio-telemetry in August, he has not returned to Secret Springs. 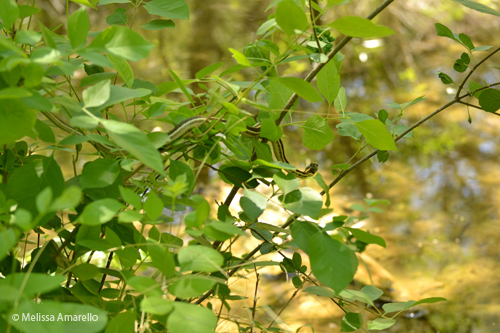 He spent most of this spring near the Nature Trail, making him the perfect snake to track with preserve visitors. Anyone who wanted to track a rattlesnake this spring April has met Bane. Save the Frogs Day attendees checking out Bane, 27 April 2013. Snake Count weekend was no different. 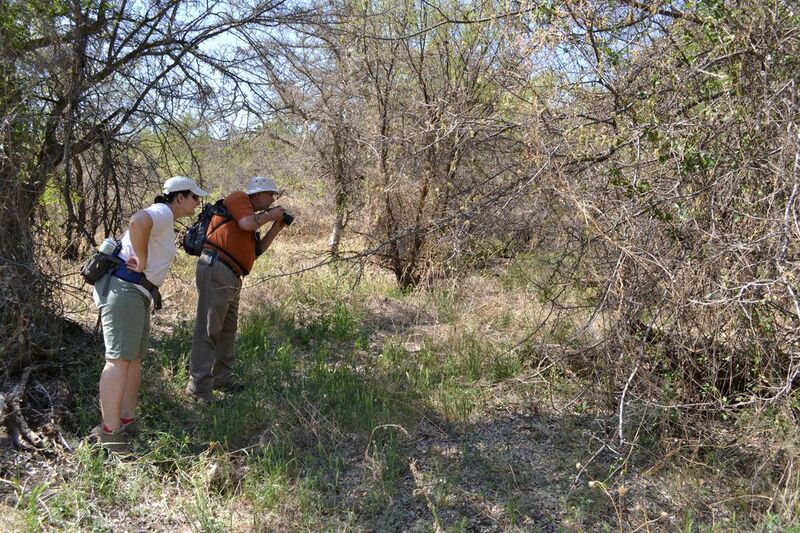 We visited Bane two or three times with Snake Counters, who got to meet Muleshoe’s largest Arizona black rattlesnake. As usual, he was just off the Nature Trail on Friday and Saturday. Sunday afternoon (19 May), Bane’s signal was erratic, as if he was moving. And he was. He had crossed Hot Springs Wash and was cruising alongside the Nature Trail toward Secret Springs! 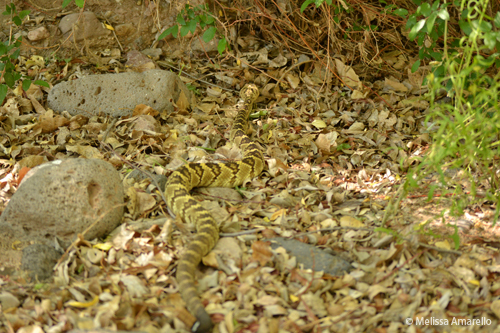 The is the snake that kicked off Snake Count for us last year. 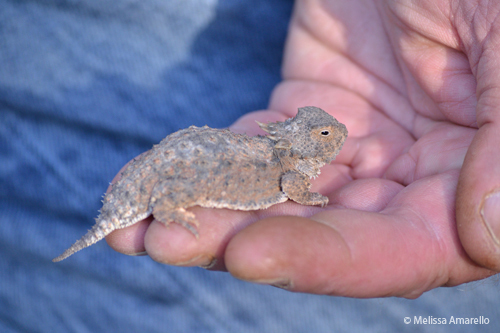 Jeff and I were driving through the the uplands on Muleshoe Ranch road when we saw a bright pink ‘thing’ on the road. We were both thinking it couldn’t be a snake (snakes aren’t pink?). Thankfully we realized how wrong we were in time to stop. Coachwhips (Coluber flagellum) are a great example of how colorful snakes are. I think many people consider snakes drab because they rely so heavily on camouflage, but you can be brilliantly colored and perfectly camouflaged. 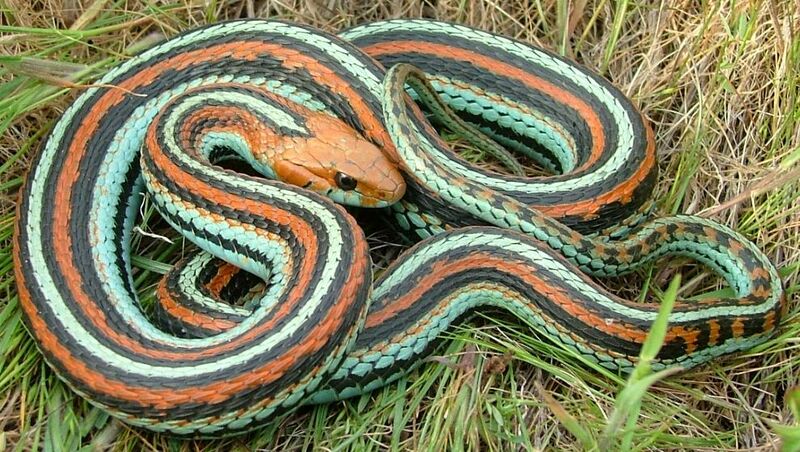 San Francisco gartersnake (Thamnophis sirtalis); you’d be surprised how difficult it can be to spot these in their habitat. I know he looks terrible, but he’s just playing dead – it’s a defensive behavior! and an in-between that looks like you mixed the other two varieties together. You might expect these different color variants to be found in different habitats, but it’s possible to find all these colors in a single population of coachwhips. So why the dramatic color variation? Good question and I’d love to hear you thoughts below or on facebook. Snake Count is almost here! 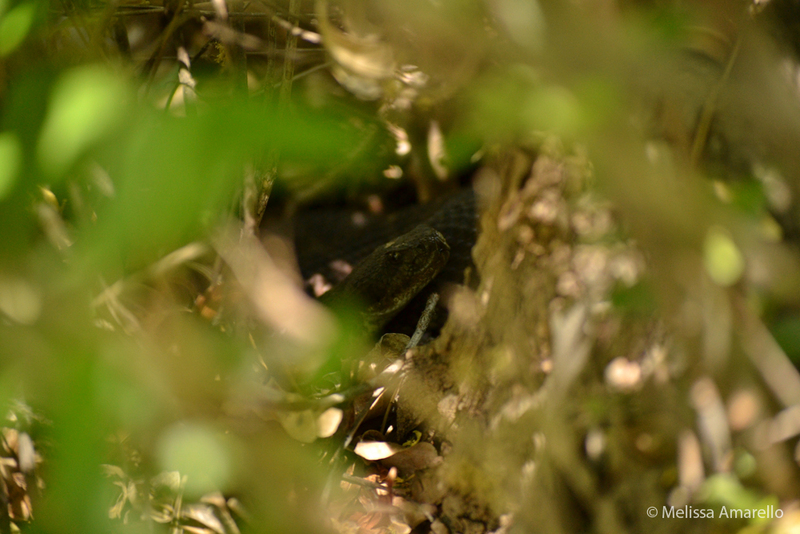 This week we countdown to Snake Count with a post each day featuring a snake we found during last spring’s Snake Count. We hope you’ll join us at Muleshoe for Snake Count, but if you can’t, find a way to participate in your area by clicking on the graphic below. I’m going to start with Arizona black rattlesnakes (Crotalus cerberus), because even among rattlesnakes they’re extra cool. 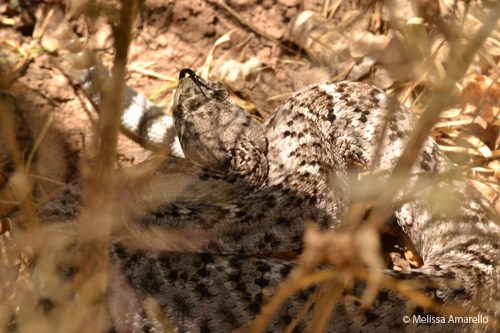 In case you missed it, our SocialSnakes blog featured a special post for Mother’s Day all about parental care in Arizona blacks. 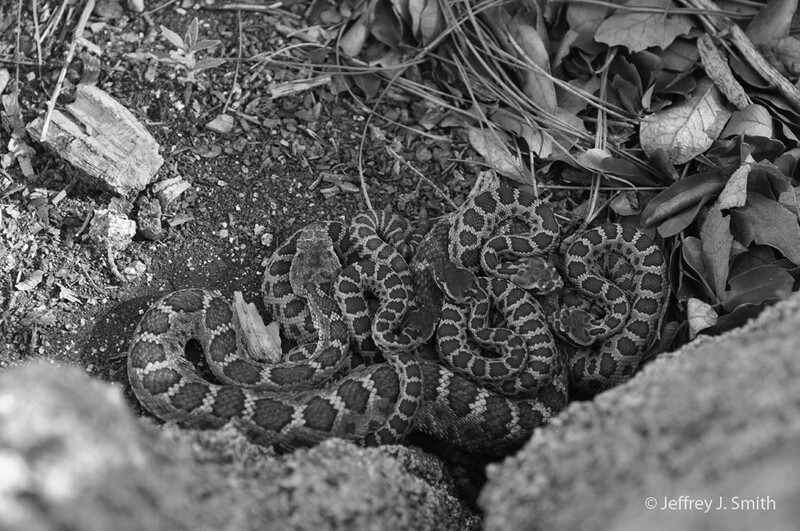 Rattlesnakes take care of their kids? You bet they do and not just Arizona black rattlesnakes. 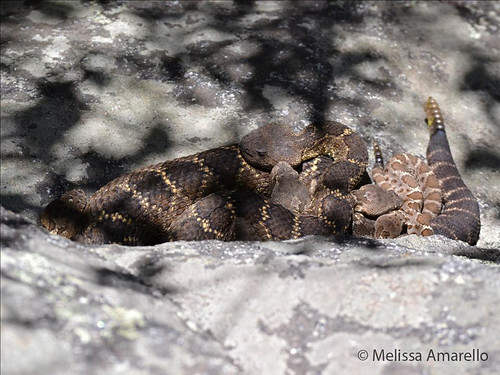 But we have lots of stories, photos, and videos of Arizona black rattlesnake families, so check them out. Eve and kids (likely not all hers) – aren’t they adorable? 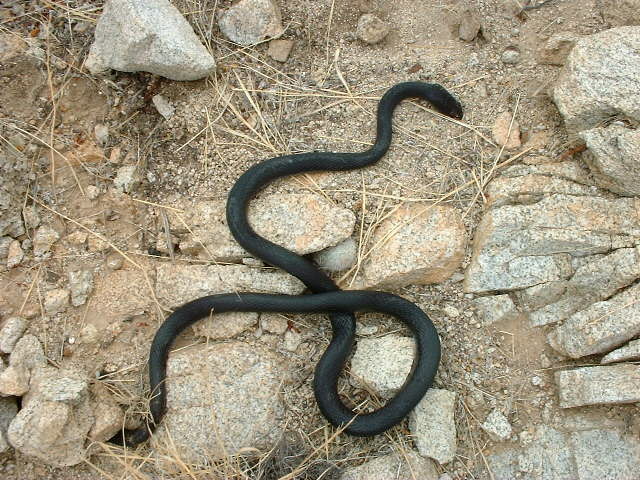 Arizona black rattlesnakes are highly social snakes, which is another topic covered extensively at SocialSnakes. But in brief, they often den in groups and within these groups have friends (snake they preferentially associate with) and enemies (snakes they avoid). 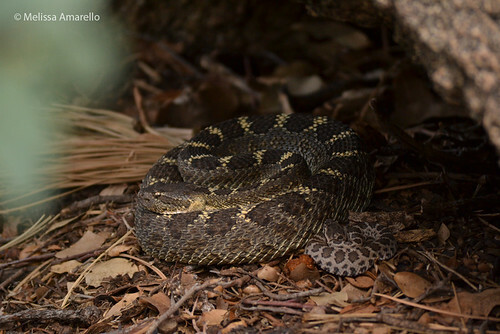 If those behaviors aren’t enough for ya, Arizona black rattlesnakes also change color. While lizards are more famous for their color-changing abilities, a handful of snakes can dramatically shift their color too. 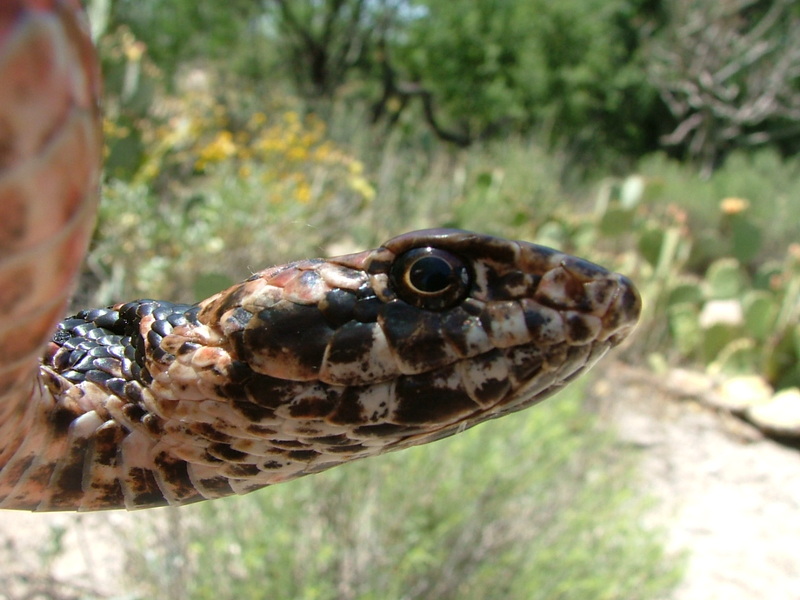 It is fairly common for young snakes to look completely different than adults (ontogenetic color change). 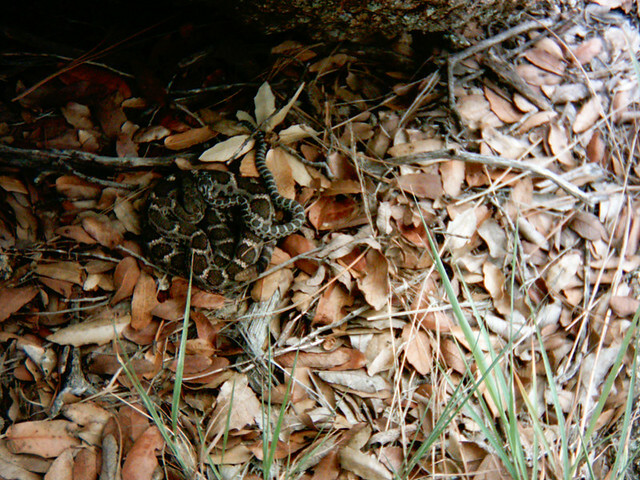 Adult male (left) with newborn (right) Arizona black rattlesnake. But, Arizona black rattlesnakes can also rapidly change their color (physiological color change) from black to light gray within minutes. I’ll end with Cat edhibiting another characteristic Arizona black rattlesnake behavior: looking absolutely gorgeous. 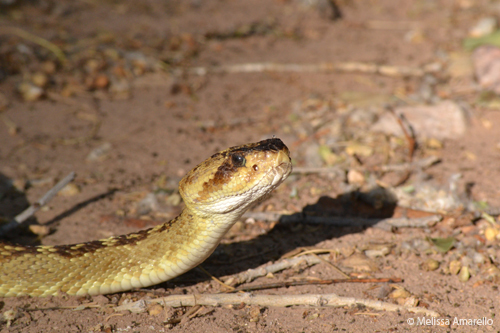 In 2011, the Center for Snake Conservation started a twice yearly Snake Count “to map and track snake distributions across North America.” Additionally, the goal of Snake Count is to get everyone (not just scientists) to take an interest in the snakes they see and get involved in conservation. The whole weekend was a ton of fun, but a few finds really stand out. 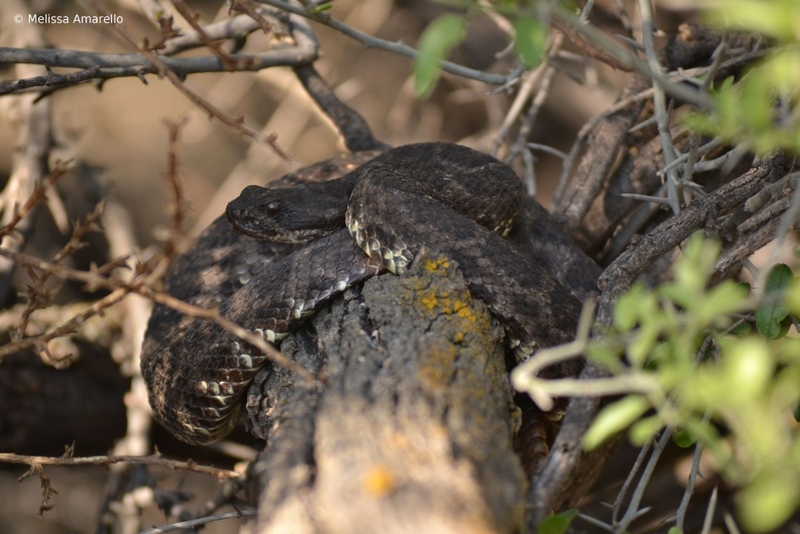 The snake counters arrived at Muleshoe ~10am Friday morning, started their search at ~11am, and almost immediately were rewarded by this little cutie, a juvenile Arizona black rattlesnake (Crotalus cerberus). 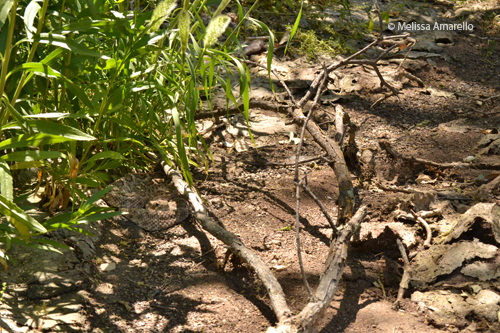 This juvenile Arizona black rattlesnake was originally found beneath this slab of wood. 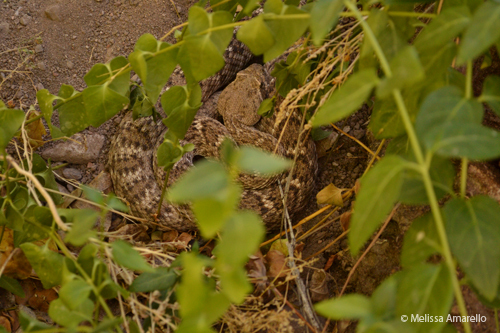 Gophersnake (Pituophis catenifer) climbing in the grapevine. Although this was officially a snake count, we kicked off our long-term reptile monitoring project, with not one, but THREE Gila monsters (Heloderma suspectum). Gila monsters have been protected in Arizona longer than any other reptile, so we have permits to capture, measure, and photograph (for identification) them at the ranch. Stay tuned here or follow us on facebook for more details as we get closer to the big event!